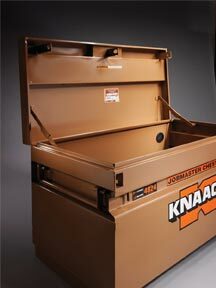 Knaack jobsite storage boxes keep your tools safe, but what keeps your Knaack box safe? The paint. It is the only thing keeping the evil, that is rust, from eating away at your security. After years of using your box as a workbench, saw horse, a miter stand; not to mention all of the loading and unloading, your box will get scratched. Once the elements hit that exposed metal, it is only a matter of time until rust begins to form. The new exclusive powder paint coating that is now standard on the entire line of Knaack Jobsite products offers several improvements over the previous liquid enamel paint. In testing, they found the powder paint to be 5x more corrosion resistant, 2.5x more abrasion resistant, and 2x scratch resistant. "We are pleased to offer our end users improved protection for their investment in KNAACK jobsite products," said Bill Zbylut, VP marketing of Knaack LLC. "Knaack is always looking for ways to continually enhance product performance, and our new powder paint process is another example of KNAACK leadership. We now offer an advanced solution to contractors who want and expect excellent resistance to corrosion, abrasion and scratching."